Fifty new first year students will start classes next week at Boise’s Concordia Law School. That’s the largest incoming class since the school opened in the fall of 2012. Concordia’s third year class is almost as large but many of them won’t be taking classes this fall. 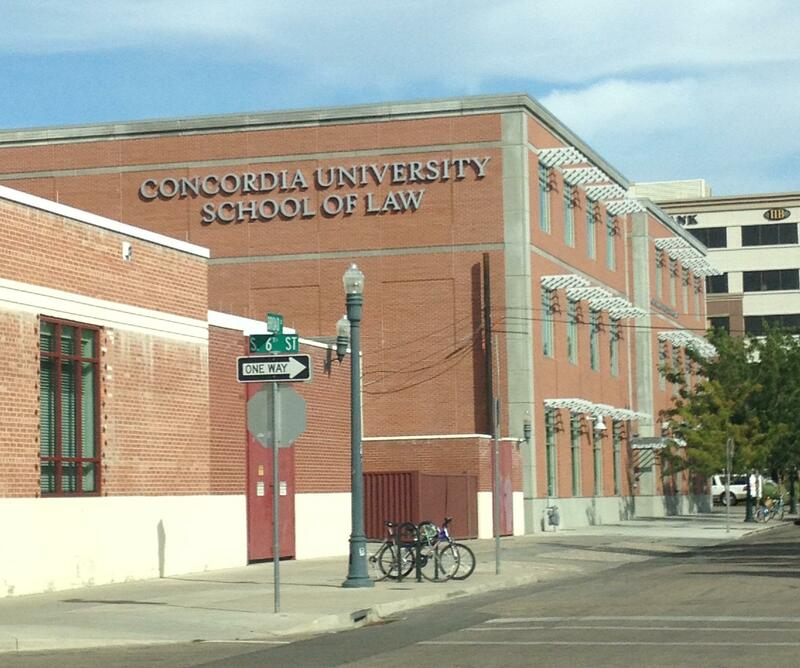 Concordia's Boise law school is downtown. “Approximately half of our third year law students are taking a break for fall semester while they await information on the accreditation process,” says Concordia Spokesperson Madeline Turnock. Concordia is trying to get provisional accreditation from the American Bar Association (ABA) but the ABA has delayed the process while it takes a closer look at the school. That puts third year students in a tricky spot. Idaho law says if the school doesn’t get provisional accreditation by the time they graduate, they won’t be able to take the bar exam and so won’t be able to practice law. This fall, while half of third year students are taking a break the ABA is expected to send a fact finder to Concordia. Madeline Turnock says having so many students gone will not affect the school’s review. Concordia could still get provisional accreditation in time for its spring graduates to take the bar. But The ABA has not told the school when it will decide. American Bar Association accreditation is a multi-year process, so students at any new law school take a risk when they sign up. Schools can get provisional accreditation after about two years in business. It usually takes a few more years to get the full accreditation but they are considered the same in terms of a law school grad’s standing in the legal profession. Here’s an overview of the ABA’a most recent accreditation decisions. In 2013 the ABA granted the provisional OK to Belmont University’s new law school. That was in time for the Tennessee school’s first graduates. In 2012 two schools got the provisional status. University of Massachusetts-Dartmouth’s law school was new and got the ABA blessing in time for its first graduates. California’s private La Verne University had been turning out law graduates since the 1970s but unlike Idaho, graduating from an ABA accredited school is not mandatory before entering the profession in California. La Verne had gotten provisional accreditation before but lost it for not living up to ABA standards. In 2011 the ABA denied provisional accreditation to Lincoln Memorial University’s Duncan School of Law. But UC-Irvine School of Law got provisional and four law schools got full accreditation. It has been a tense few weeks at Boise's Concordia School of Law. Faculty and students had hoped to hear earlier this month if the American Bar Association (ABA) would grant it provisional accreditation. Instead, the ABA decided it needed more time to consider and would send someone to Boise for a closer look at Concordia. But the ABA didn’t tell school administrators why it wanted closer scrutiny or give a timeline for when things might move forward. But now Concordia dean Cathy Silak says the ABA told her Tuesday it will send a fact-finder in September. Boise’s Concordia Law School will have to wait longer to find out if its first graduating class will be able to practice law in Idaho. The more than 40 students in Concordia’s class of 2015 expected to find out Monday if they’d be able to take the bar exam when they graduate. Instead, the American Bar Association (ABA) told them they’d have to keep waiting. Everything about Concordia is new. The leather spines of the library books look un-cracked and the furniture looks like catalogue pictures. But Spencer Lay has been around the block. He's an ex-marine who did tours in Iraq and Afghanistan. The Idaho Board of Education has approved a plan to allow second-year University of Idaho law students to take classes in Boise. It's the second time the state board has granted the request from UI — but last year the budget approval for the expansion was voted down in the Legislature. UI Vice President for Finance and Administration Ron Smith says he's hopeful that this year lawmakers will support the expansion. Third-year curriculum is already being offered at the UI's law school program in Boise.